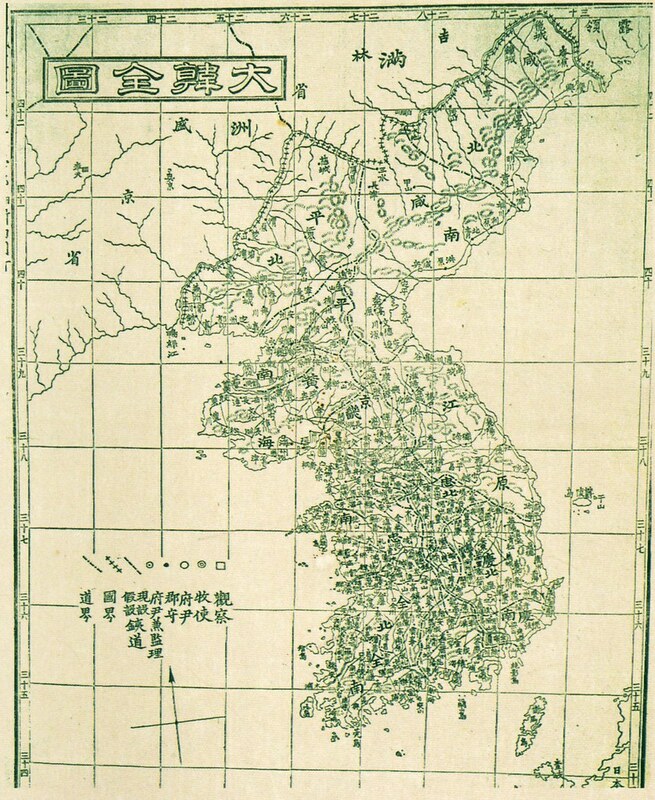 The Korean map below was included in the 1899 edition of the "Daehanjiji (大韓地誌), which was a Korean geography book written by Hyeon Chae (玄采). The book was published in two volumes, of which the cover of the first volume is pictured on the left. The book is comprised of thirteen chapters, excluding the introduction. The thirteen chapters describe the geography, history, economy, and other features of the thirteen provinces that made up Korea at the time. 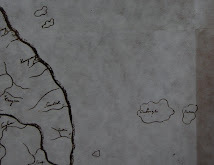 A Map of each province was also included in each chapter. 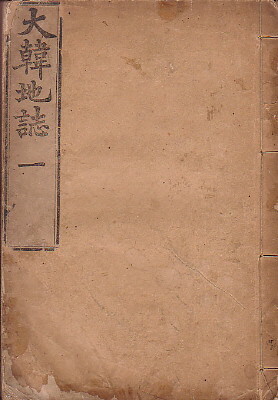 The forward (序) of the book was written by Lee Gyu-hwan (李圭桓), who was the director of the editorial office for Korea's Ministry of Education (學部) at the time. 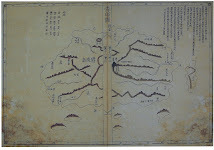 The Korean map below was placed in the front of the book, before the introduction. The map is called the "Daehan Jeondo" (大韓全圖), which means "Complete Map of Korea." If you look at Ulleungdo (鬱陵島) on the map, you will notice a small neighboring island off its east shore labeled as "于山" (Usan). 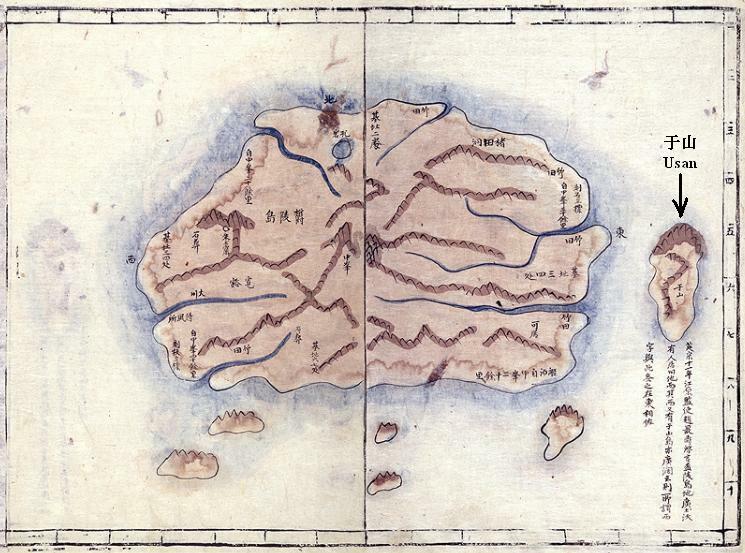 Korean historians claim that Usando (于山島) was the old Korean name for "Dokdo" (Liancourt Rocks), but the map below shows that "Usan" was just a neighboring island of Ulleungdo. The lines of longitude on the map show Ulleungdo and its neighboring island of Usan to be between the 130 (三十) and 131 degree lines of east longitude. That would exclude the island labeled as "Usan" on the map from being Liancourt Rocks (Dokdo) since Liancourt Rocks is located east of the 131 degree longitude line at 131 degrees 52 minutes. There are sixty minutes in a degree of longitude, which means that Liancourt Rocks are located very close to the 132 degree line. 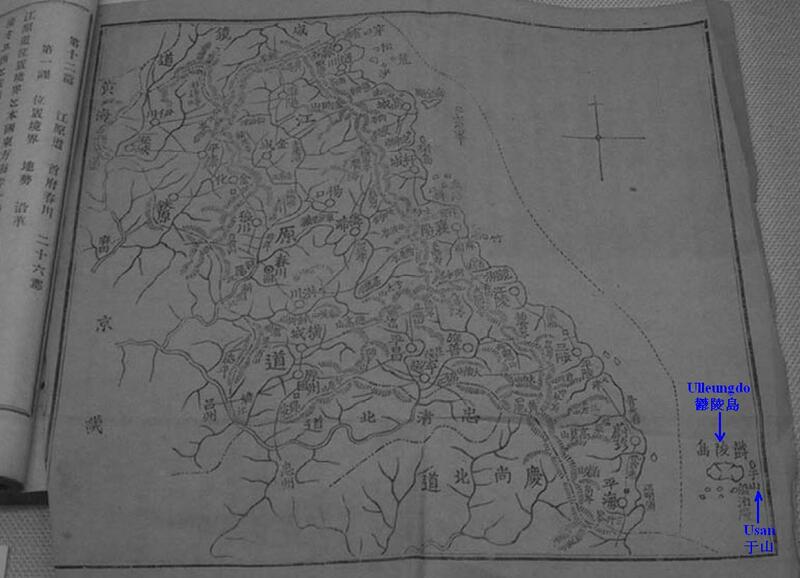 The following is a map from the chapter on Gangwon Province from the 1901 edition of the "Daehanjiji (大韓地誌). Ulleungdo (鬱陵島) appears on the map because it was considered a part of Gangwon Province in 1901. If you look at Ulleungdo on the map, you should notice that this map also shows "于山" (Usan) as a neighboring island of Ulleungdo, not as Liancourt Rocks (Dokdo). In fact, Usando (于山島) was never shown as Liancourt Rocks (Dokdo) on any map, Korean or Japanese. 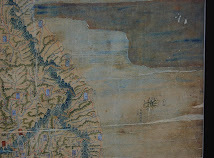 The "Cheonggudo" map is 8.7 meters tall and 4.62 meters wide and is the largest of Korea's old maps still in existence. The map is made up of hundreds of ruled paper panels. It is twenty-nine panels high and twenty-two panels wide. The height of each panel represents a measure of 100 ri (40 kilometers), and the width represents a measure of seventy ri (28 kilometers). The rule along the edge of each panel are measured in segments of ten ri (4 kilometers). 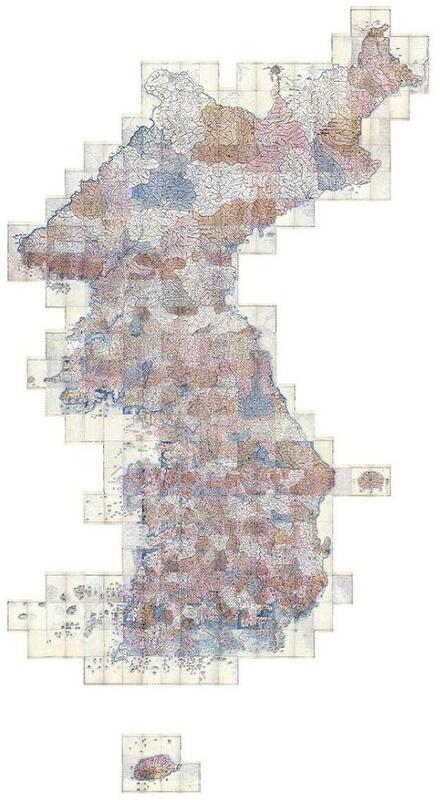 That means the map shows the length of the Korean peninsula to be about 3,000 ri, and its width to be about 1,500 ri. The scale of the map is about 1/216,000th of actual size. 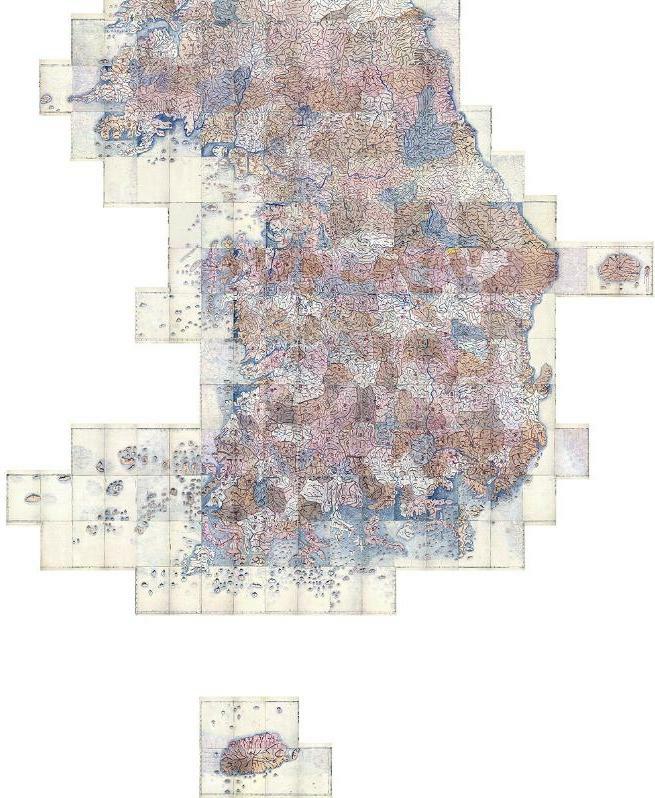 In one of the scans belows, you can see that two panels were used to represent Ulleungdo. 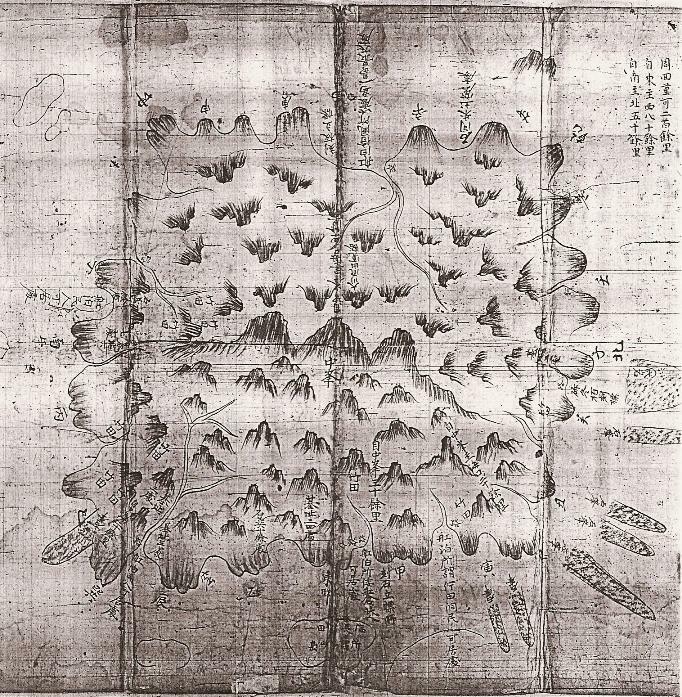 Usan (于山) was drawn about one 10 ri (4 kilometers) segment off the east coast of Ulleungdo. 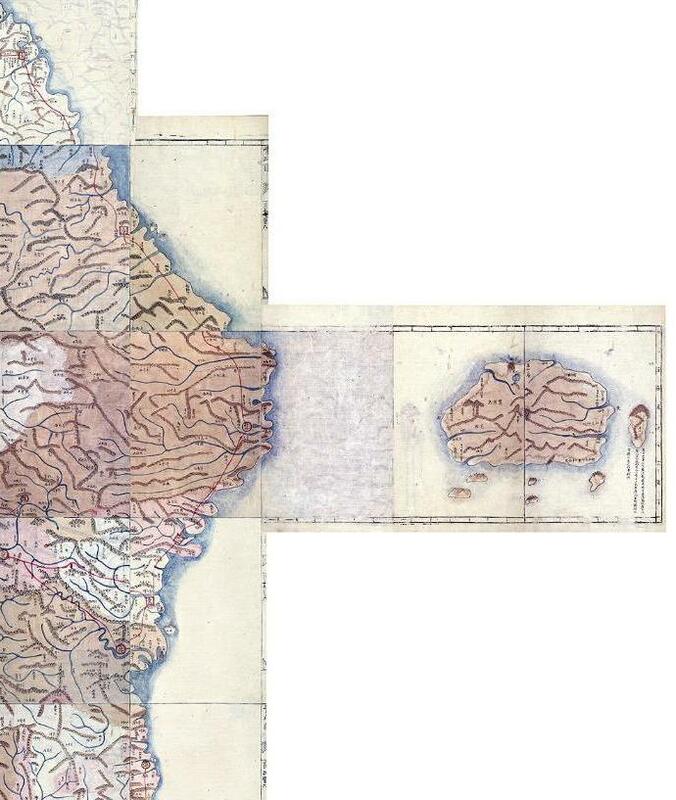 Koreans claim that Usando (于山島) was the old name for "Dokdo" (Liancourt Rocks), but this 1834 map shows that Usando was almost certainly Ulleungdo's neighboring island of Jukdo (竹島), which is about 2.2 kilometers off of Ulleungdo's east shore. The islands to the south of Ulleungdo were probably misdrawn since they most likely were supposed to represent the rocks off the northern shore of Ulleungdo, not the southern shore. The following "Map of Corea" was made in 1922. The Korean title of the map is "Daehanminguk Dido" (대한민국 디도), which means "Map of the Republic of Korea." The title suggests that independence-minded Koreans made the map to show Korea as an independent state. At the time, Korea was a colony of Japan. The Korean island of Ulleungdo is labeled on the map as "울릉도" (Ulleungdo) and "울도" (Uldo). "Dokdo" (Liancourt Rocks) was not shown on the map. In fact, the border of the map stops at 130 degrees E. longitude, which means that since "Dokdo" (Liancourt Rocks) is located beyond 130 degrees at 131.52 degrees E. longitude, the independence-minded Koreans who made the map apparently did not consider it to be a part of Korean territory or, at best, not important enough to show on the map. The map also shows the Sea of Japan labeled as "대한해" (Sea of Korea). The map is stored in Korea's "Independence Hall Museum." This is an example of how documents are interpretable differently. To follow is the famous part from "Onshu-shicho-goki" by Saito Hosen. Its center is Saigo Toyosaki, south bank of Suki-gun（周吉郡）. If you go 35-ri south you will get to Miho-no-seki of Unshu. If you go 58-ri Southwest you’ll get to Yu-no-tsu of Sekisyu (west of Shimane prefecture). From north to east there is no place to go. the northwest of Japan, we make this place to be the boundary. The words in green mean the part I added for people who may be not familiar to Japanese names. is also called Oki Island. which Ji-bu-gun and Hae-bu-gun belong. (囑・), to which Ju-gil-gun and On-ji-gun belong. To the Southeast it is 35 ri to Onshu (Province). (Province) and beyond there is no land. days and one night in the direction of Northwest one reaches Matsushima (Dokdo). Also there is Takeshima (Ulleungdo) at another day's travel distance. It is so called Isotakeshima, rich in bamboo,fish, and sealion. viewing Oki (Province) from Onshu (Province). Thus, this "餠" (Oki Province) marks the northwestern boundary of Japan. The words in red was added by the site owner. The second sentences in green are from my translation, the third sentences in blue are from the pro-Korean's site. If you go 40-ri Southeast you’ll get to Akasaki of Hakushu (mid-west of Tottori prefecture). The pro-Korean site owner's sentence has an error, 辰巳 means southeast, not southwest. The pro-Korean site owner's sentence has an error, 未申 means southwest, not northeast. and beyond there is no land. The pro-Korean site owner's sentence has an error. 自(from) 子 means "from north" and 至 (to)卯 means "to east", so the author wrote about from north to east, not "beyond there". Going further from there for two days and one night in the direction of Northwest one reaches Matsushima (Dokdo). These two are uninhabited islands. From there you can view Korea, it is just like you view Onshu (Oki island) from Unshu (east of Shimane prefecture, mainland of Japan). and getting a sight of Koryo (from there) is like viewing Oki (Province) from Onshu (Province). The pro-Korean site owner's sentence has an error here again. Onshu is Oki, so viewing Oki from Oki doesn't have a meaning. The author is putting emphasis here about viewing Korea (Koryo). He illustrated it as it was seen very near, just like viewing Oki island from mainland of Japan (Unshu). So then, the northwest of Japan, we make this place to be the boundary. (we) make it the boundary (為限). The author didn't say "the northwestern boundary". The author Saito Hosen put emphasis on "viewing Korea" and it was "just like" viewing Oki from mainland of Japan. So the boundary in the last sentence should be the place where the author saw Korea. It can't be Oki because Saito wrote that it was "just like" viewing Oki, which means it was not Oki he saw. The author only wrote "此州" (this place, or this state, or this island) but the pro-Korean site owner added "Oki Province" intentionally. So everyone should be alert when you read translated texts. I recommend you to read translated texts from reliable sources and when you read them you should also take a look at the original documents. Addendum: Saito Hosen wrote that the place of "Northwest" should be the boundary. The pro-Korean owner insists that he meant Oki island, but Oki is located just north of mainland of Japan. Please take a look at the map of Japan. The place of "Northwest" of Japan is definitely Takeshima (Ulleungdo). Japan and Korea are no longer disputing each other's claim to Ulleungdo since Japan conceded Ulleungdo to Korea in the 1690s, but the two countries are disputing over Liancourt Rocks, which are a small group of rock islets about ninety-two kilometers southeast of Korea's Ulleungdo and about 160 kilometers northwest of Japan's Oki Islands. Koreans call the rocks "Dokdo," and Japanese call them Takeshima (竹島), which was also the former Japanese name for Ulleungdo. The Jang Han-sang expedition to Ulleungdo in 1694 is significant in the Dokdo/Takeshima debate for a few reasons. One reason is that it seems to be the only time that Liancourt Rocks (Dokdo/Takeshima) was mentioned in Korean records. In the record, no name was given for Liancourt Rocks, but Jang Han-sang said that he saw, from a peak on Ulleungdo, an island in the distance, about 300 ri (120 kilometers) southeast of Ulleungdo. We know that he did not travel to Liancourt Rocks because he estimated the size of the island to be about one third the size of Ulleungdo; however, Ulleungdo is actually about 391 times bigger than Liancourt Rocks. Another reason the Jang Han-sang expedition to Ulleungdo is significant in the Dokdo/Takeshima debate is that Jang Han-sang said that Ulleungdo was "the so-called Sambong" (此所謂 三峯), which was a reference to Sambongdo (三峯島). "Sambongdo" means "Island of Three Peaks." Koreans say that Sambongdo was one of the old names for "Dokdo" (Liancourt Rocks), but Jang Han-sang's report and other references to Sambongdo in Korean documents show that Sambongdo was just another name for Ulleungdo. 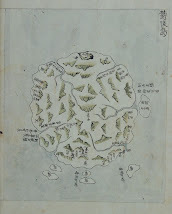 A third reason that the Jang Han-sang expedition is significant is that he reported seeing a small island about five ri (2 kilometers) off the east coast of Ulleungdo. 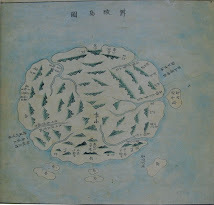 He said that the island had groves of haejang bamboo (海長竹) on one side. The island he was talking about was almost certainly Ulleungdo's neighboring island of Jukdo, which is about 2.2 kilometers off Ulleungdo's east shore. The fact that he said the island had groves of haejang bamboo (海長竹 or 海藏竹) on it is also significant because haejang bamboo is a particular type of bamboo that can grow seven meters tall. 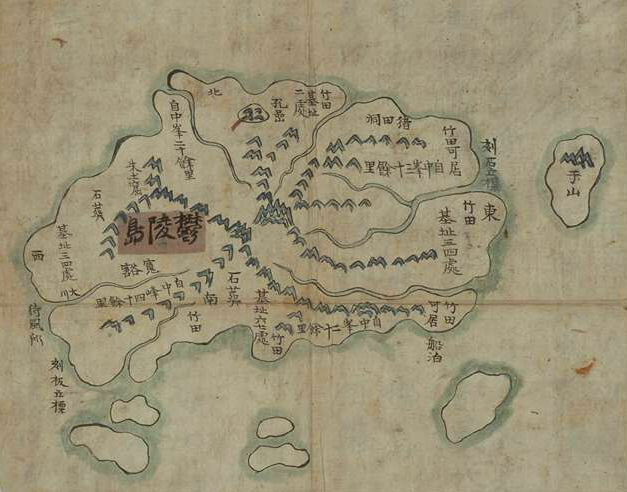 On a 1711 map of Ulleungdo, made by Ulleungdo Inspector Bak Chang-seok (朴昌錫), there is a small island off the east coast of Ulleungdo labeled "Groves of Haejang Bamboo, the so-called Usando" (海長竹田, 所謂于山島). 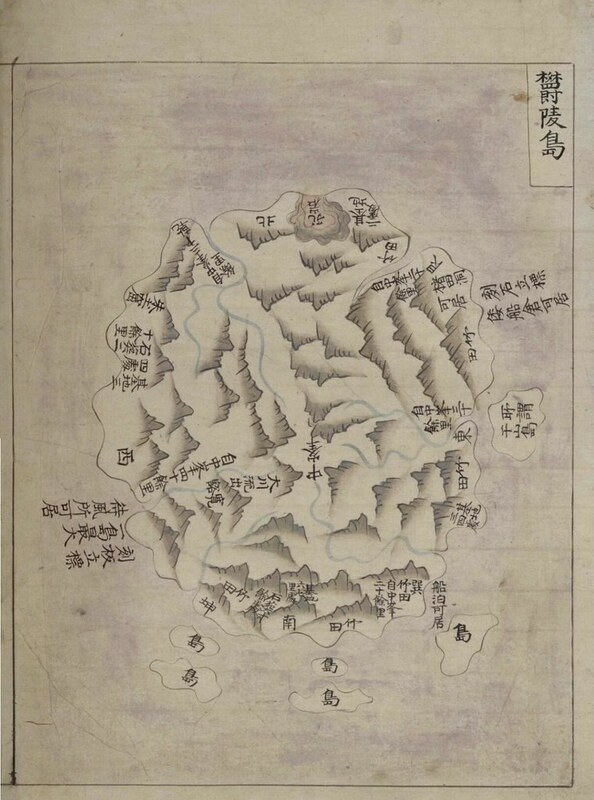 Koreans claim that Usando was the old Korean name for "Dokdo" (Liancourt Rocks), but Jang's 1711 maps shows that Usando could not have been Dokdo because Dokdo does not have the soil to grow "groves of haejang bamboo." Besides, Dokdo is ninety-two kilometers southeast of Ulleungdo, but Jang's map shows Usando just offshore of Ulleungdo. 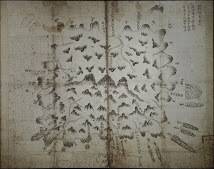 Considered together, Jang Han-sang's 1694 expedition report and Bak Chang-seok's 1711 map make it quite clear that "Usando" was not Liancourt Rocks, but was, instead, an old name for Ulleungdo's neighboring island of Jukdo (竹島), which, by the way, does have bamboo growing on it. 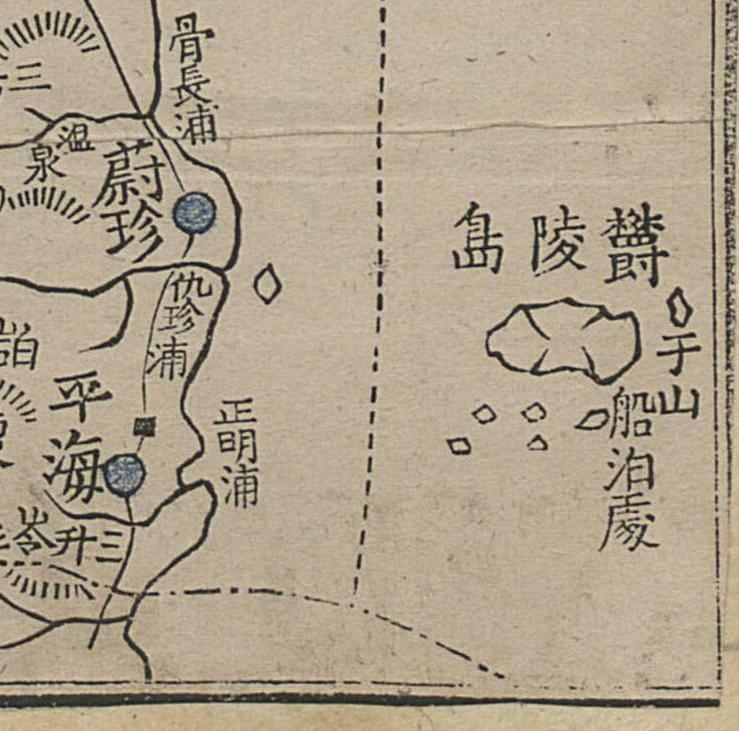 Here is the relevant portion of Jang Han-sang's 1694 report (蔚陵島事蹟) and scans of Bak Chang-seok's 1711 map of Ulleungdo. 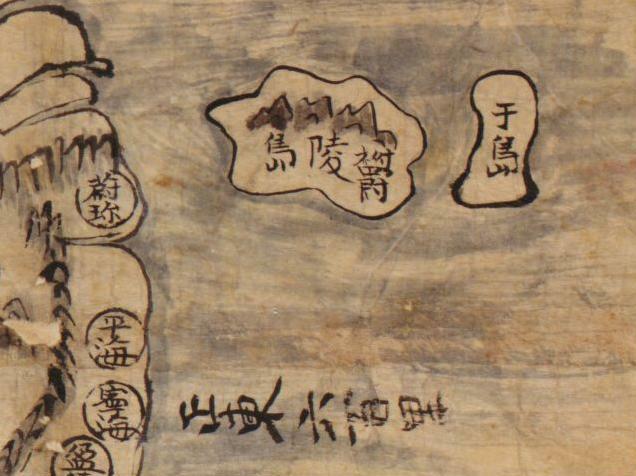 Notice that in the center of the island on Bak's map, he drew three peaks (三峯) in a way that they stood out from the surrounding peaks. 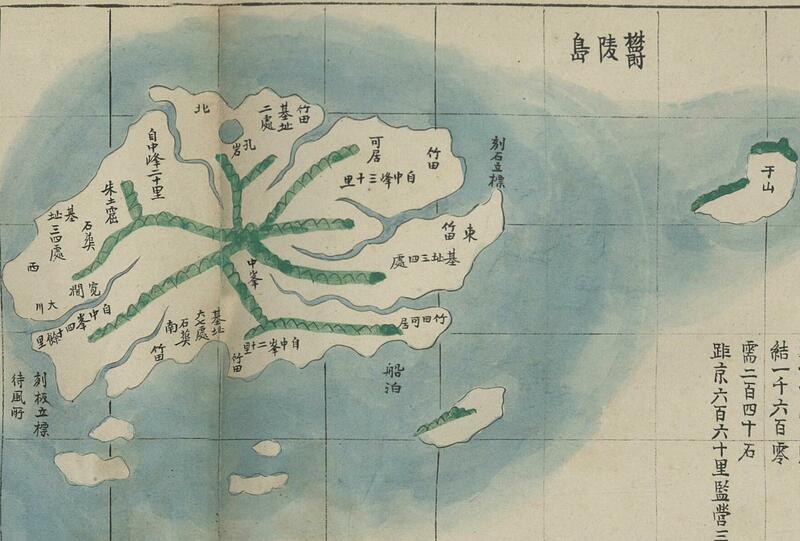 This is more evidence that Sambongdo (三峯島 - "Island of Three Peaks") was just another name for Ulleungdo. About five ri to the east is one small island. It is not very big or very high, and it has a grove of haejang bamboo (海長竹) growing thickly on one side. On a day the rain clouds cleared and the fog settled, we went into the mountains and climbed the central peak. Two tall mountains to the north and south were facing us. This was the so-called Sambong (三峯 - "Three Peaks"). The winding shape of Daegwanryeon (大關嶺 - mountain range on the east coast of the Korean peninsula) was visible to the west. Looking toward the east, there was one island far off to the southeast. The size was only about one-third of Ulleungdo. It was only about 300 ri [120 kilometers] away. 동쪽으로 5리 (2킬로) 쯤에 한 작은 섬이 있는데, 고대(高大)하지 않으며 해장죽 (海長竹)이 한쪽면에 무더기로 자라고 있다. 비 개고 안개 가라앉는 날 산으로 들어가 중봉에 오르면 남북 양봉(兩峯)이 높다랗게 마주보고 있는데 이를 삼봉(三峯)이라고 한다. 서쪽을 바라보면 대관령의 구불구불한 모습이 보이고 동쪽을 바라보면 바다 가운데 한 섬이 보이는데 아득히 진방(辰方)에 위치하며 그 크기는 울도의 3분의 1 미만이고 (거리는) 삼백여 리에 불과하다. 東方五里許 有一小島 不甚高大 海長竹叢生於一面 霽雨?捲之日 入山登中峯 則南北兩峯 岌崇相面 此所謂三峯也 西望大關嶺逶迤之狀 東望海中有一島 杳在辰方 而其大滿蔚島三分之一 不過三百餘里. The following was copied from the Free Board (게시판) at Hanmaun's Web site. I have lived in Korea for a long time, but I still do not understand why Koreans have to look at Dokdo and other Korean history as absolutes. 이 자의 주장은, 우산도가 죽도나 관음도라고 주장하는 쪽임. 지도를 가지고 그럴듯하게 논리를 꾸며대는데 능하므로 이 사이트의 주장을 논파하는 논리 구축과, 대응되는 영어판 독도 사이트의 개설이 시급함.그 사이트에 직접 코멘트를 달지 말것! 일부러 혐한 사이트를 유명하게 만들뿐이므로! 그 사람 짤렸는지 모르지만, 어디에선가 또 영어강사를 하고 있습니다. 참...댁이 써주신 웹사이트는 그냥 혐한사이트가 아니라 일본인전용 독도전문자료사이트입니다.그 외의 주장은 무시되는 곳이죠.유명한 사이트도 아닙니다. 독도에 대한 일본측의 주장이 어떤 것인가 보려면 방문해보는 것도 좋습니다. 이 사이트 방문한 적이 있습니다.Gerry-Bevers는 일본 극우의 하수인이죠. 그가 접하는 자료 거의 대부분이 혐한 일본인에게 받은 겁니다. 물론 그 자신이 찾은 자료나 새로운 소설을 쓴 것도 있죠. 그러나 큰 틀에서의 주장은 일본 극우학자들의 논리를 그대로 카피한 것입니다. 혐한들의 주장과 다를 것이 하나도 없어요. 이젠 자신을 위해서라도 그만할 때가 됐는데.... 뭐, 자신의 무덤을 스스로 파는 행위는 어쩔 수 없죠. 또 모르죠? 생계를 걱정하지 않아도 될, 누군가의 지원이 있을지도....전, 그가 왜 아직도 한국에 남아 있기를 고집하는지 이해할 수 없습니다.한국을 떠나 자신의 고국에서 독도에 대한 글을 올려도 좋을 텐데.... 이건, 실례가 되는 발언인가요? 여하튼 전, 그 부분에 의구심을 가지고 있어요. 아무래도 한국을 떠나면, 그의 주장이 빛을 잃게 될 가능성이 큽니다. 한국에 살고 있는 전직 교수 외국인과 한국과는 아무 관련이 없는 외국인은 그 어감이 크게 다르죠. 일단, 제 사이트를 영문화하기 위해서는 현재의 글을 좀더 다듬고, 오류나 오기를 시정하여, 지금껏 모아둔 새자료를 업데이트하고 구성하는 작업이 우선 되어야 합니다. 지금 예정으로는 11월달은 그러한 작업을 하고, 12월부터는 본격적으로 영문화를 시도할 생각입니다. 그런데, 모든 것이 제 뜻대로만 이루어지는 것은 아니더군요. 적어도 최선을 다하겠다는 약속은 드릴 수 있습니다. 한마음씨가, 왜 독도 자료를 모으고 토론하세요? 역사 공부는 재미가 있어서 그러시는 거지요? 저도 재미 있어서 하는 거에요. 한국을 욕하려고 하는 것이 아니고 그냥 역사 진실를 알고 싶어서 하는 거에요. 한국 독도 주장에 대하여 그 반론을 하려며는 왜 한국을 먼저 떠나야 할 수 있다고 생각하세요? 한국 영토 안에서 이견이 있으면 안 되는 법이 있어요? 한국에서는 독도에 대한 이견자유가 정말 없으세요? 독도이견을 가진 사람은 왜 생계 협박을 받게 되는 건가요? 일본 극우학자들이 독도에 대하여 무슨 생각, 무슨 말하는지 모르겠어요. 제가 일본어로 쓴 책이 없고 있어도 못 읽는 무식한 사람이에요. 제가 가지고 있는 책은 하나 빼고 다 한국 사람들이 쓴 책이에요. 그리고 한국 사람이 안 쓴 그 한 권은 나이토세이쮸우씨가 쓴 책을 번역한 "獨島와 竹島"인 거예요. 제가 알기로는 그 분은 일본극우가 아닌 사람이에요. 그리고 아무한테서 지원을 받는 것이 없어요. 한마음씨가 왜 그런 생각을 하는 지 모르겠어요. 제가 영어 강사로 일하는 것 뿐이에요.제가 한국을 좋아해서 한국에서 사는 거에요. 한국사람의 역사절대주의 빼고는 모든 한국 문화가 좋아요. 한국의 여러분, 우리는 여러분이 독도가 한국령이라고 믿고 있어지는 것을 알고 있습니다.그러나, 한편, 우리는 그 섬이 실은 일본령이라고 하는 것을 확신하고 있습니다.양국의 우호를 위해서 한번 더, 함께 역사를 검증해 보지 않겠습니까? 감정이 아니고, 과학적으로 이성적인 눈으로 한번 더 재검토해 보세요. 이하가 지금까지 우리가 조사하고 사실이라고 생각한 항목입니다. (1) 우야마시마는 독도(Liancourt rocks)는 아니다. (2) 대한제국(1897-1910)에서는 조선의 동쪽의 국경은 울능도라고 생각하고 있었다. 따라서 1900년의 칙령 41호에 쓰여진 이시지마는 독도는 아니다. (3) 안용복은 「일본의 마츠시마는 우야마시마다」라고 주장했지만, 안용복자신이 우야마시마가 어디에 있는지, 어떤 섬인가 이해하고 있지 않다.안용복의 진술은 2전재역전 하고 있고, 신뢰를 둘 수 없다.이러한 인물의 진술이 한 명 걷고 , 우야마시마=일본의 마츠시마(독도)라면 한국에서는 오해 받고 있지만, 근거가 없는 설이다. 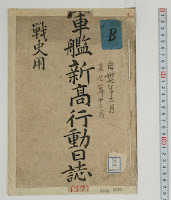 Korea claims that the old name for "Dokdo" (Liancourt Rocks) was "Usando" (于山島), but Korea's old documents talk about people living on "Yusan-gukdo" (流山國島 - 유산국도), which was a misspelling of Usan-guk Island (于山國島 - 우산국도), and old Korean maps show Usando was Ulleungdo's neighboring island of Jukdo. Korea's real "Dokdo" was Ulleungdo's neighboring island of Jukdo, not Liancourt Rocks. At the time of the following entry, Ulleungdo, the "main island" (本島), was called "Yusan-gukdo" (流山國島 = 유산국도), and its smaller, neighboring island was called "Muleungdo" (武陵島), which was an alternate spelling of "Ulleungdo" (鬱陵島). The entry says that more than sixty people grew up on "Muleungdo," but that they later moved to the "main island" (本島), which was "Yusan-gukdo." "강원도 관찰사가 울릉도 유산국의 섬 사람에 대해 보고하다"
의정부(議政府)에 명하여 유산국도(流山國島) 사람을 처치하는 방법을 의논하였다. 강원도 관찰사가 보고하였다. Koreans also claim that Sambongdo (三峯島) was an old name for "Dokdo," but Sambongdo was just another name for Ulleungdo, which has three prominent peaks that are mentioned quite often in old Korean documents. "Sambongdo" means "Island of Three Peaks." The following is from an August 30, 1479 entry from the Annals of King Seongjong. In the entry, Korean officials are discussing how to remove illegal squatters on Sambongdo. The officials mention a small island next to Sambongdo where two families are living. 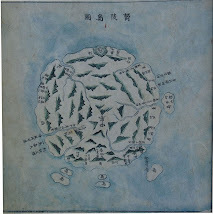 It is suggested that the small island be captured first, which would give the soldiers time to assess the situation on Sambongdo before trying to capture that island's people. It was first suggested that 1,500 soldiers be used to take the island of Sambongdo, but one of the officials felt that was too many and said that 300 or 400 could do it. Of course, the Sambongdo being referred to was Ulleungdo, and the small neighboring island was almost certainly Jukdo, not Liancourt Rocks. "영안도 경차관 신중거와 삼봉도 토벌·초무를 의논하다"
If any of the regular visitors to this blog is curious about why there has been a sudden surge in votes in our "Dokdo or Takeshima?" survey and can read Korean, you can go HERE to find part of the answer. On the Korean Web site "Daum," there is a post urging Koreans to come to this blog and vote for "Dokdo." Looking at the post, it seems to be part of a "signature drive" service offered by Daum. Maybe some of the Koreans who come here to vote will read some of the posts on our site, but I am afraid that most will just come and mindlessly vote "Dokdo." The post says that by voting for "Dokdo" and posting the link to other sites, Koreans can tell the world that "Dokdo" belongs to them. However, yelling that something is yours and proving that something is yours are two different things. Yelling may work in Korea, but it does not work very well in the US or other countries. 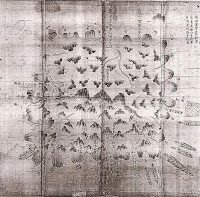 The following is one of the old maps of Ulleungdo drawn by one of the Joseon Dynasty inspectors to the island. I do not know the date of the map, but the map was shown on a KBS special on Ulleungdo Inspector Lee Gyu-won. You can see the special HERE if you are registered with the KBS Web site. It is quite interesting. You can see the map below at 17 minutes 38 seconds (17:38) into the video. Anyway, on the map below you will notice that the sizes of the rocks surrounding Ulleungdo are exaggerated. If you look off Ulleungdo's east shore, there seems to be an island labeled as Jasando (子山嶋), which would be a misspelling of Usando (于山島). 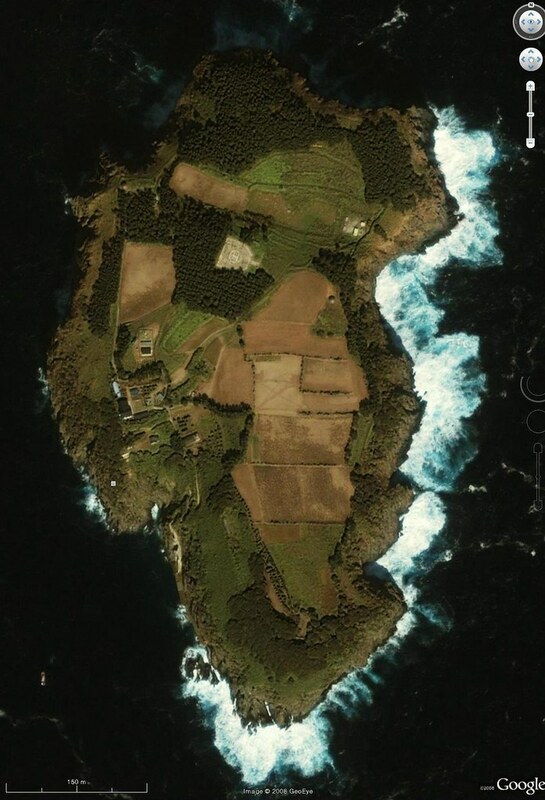 I do not know if that island is supposed to be Jukdo or Gwaneumdo, but it does seem to be labeled as "Jasando" (子山嶋). 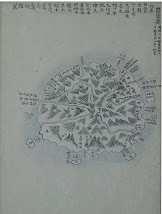 Korea claims that Usando was the old name for "Dokdo" (Liancourt Rocks), but Korea's old maps of Ulleungdo show that Usando was Ulleungdo's neighboring island of Jukdo. I wonder why none of Korea's Dokdo books or Web sites include the map below? By the way, in the video, the KBS reporter interviewed a man at the Daepungheon (待風軒), which is a building at Gusan Harbor in Uljin County, North Gyeongsang Province, that was the very same building that Lee Gyu-won and other Ulleungdo inspectors stayed while waiting for fair winds to take them to Ulleungdo. During the interview, the men at the building, which is now a community center, showed the reporter a few of the old documents from those inspections. The man said that they used to have a lot more documents, but they were all intentionally burned a few decades ago. Can anyone imagine a reason for burning such historic documents? Did the Rhee or Park administrations have something to hide? In the Annals of King Kojong, it is written that on April 7, 1882, King Kojong met with Inspector Lee Gyu-won (李奎遠), who was the official specially selected to travel to Ulleungdo to confirm reports that "foreigners" were visiting the island and removing its natural resources. This conversation between King Kojong and his Ulleungdo inspector is more evidence that Usando was not "Dokdo" (Liancourt Rocks), as Dokdo advocates claim. Inspector Lee Gyu-won was called before the king to give his farewell greeting. The king said, “Both Usando or Songjukdo (敎曰 或稱芋山島 或稱松竹島) are written in the Yeojiseungram (輿地勝覽). Songdo (松島) and Jukdo (竹島) are also used [for Songjukdo], and together with Usando, three islands combine to make up what is called Ulleungdo (而又稱松島竹島與芋山島爲三島統稱鬱陵島矣). Inspect the situation on all of them. 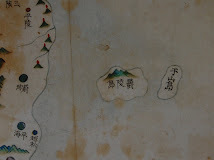 Originally, the Samcheok commander (三陟營將) and the Wolsong commander (越松萬戶) have taken turns surveying Ulleungdo, but almost all of them have been careless. They inspected only the exterior of the island, which has led to these evil practices. Notice that King Kojong and Lee Gyu-won disagreed on the number of Ulleungdo's neighboring islands. King Kojong said there were two, but Lee said there was only one. 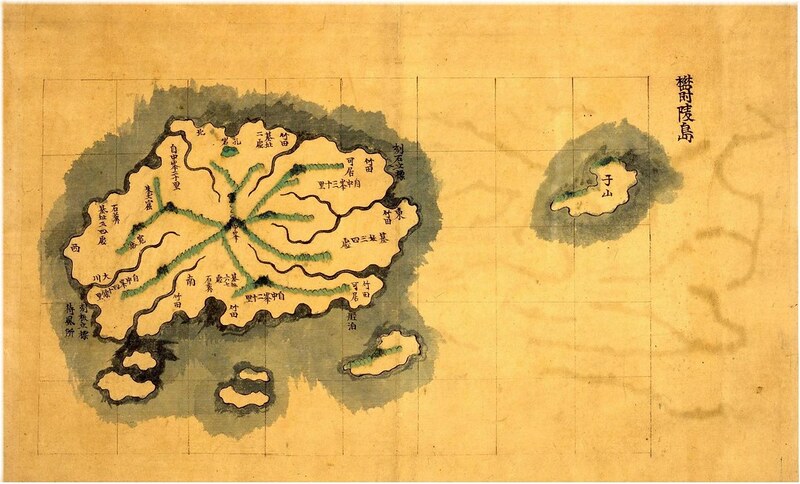 The king said "Songjukdo" (松竹島) and "Usando" (芋山島) were neighboring islands of Ulleungdo, but Lee said that Usando was just another name for Ulleungdo and that Songjukdo was the only neighboring island. King Kojong persisted and said that the names "Songdo" (松島) and "Jukdo" (竹島) were also used and that together with Usando, three islands made up what was called Ulleungdo. Lee Gyu-won, however, did not concede to the king and said that even though some people had said that "Songdo" and "Jukdo" were east of Ulleungdo, there was only one island, Songjukdo, not a separate Songdo and Jukdo. 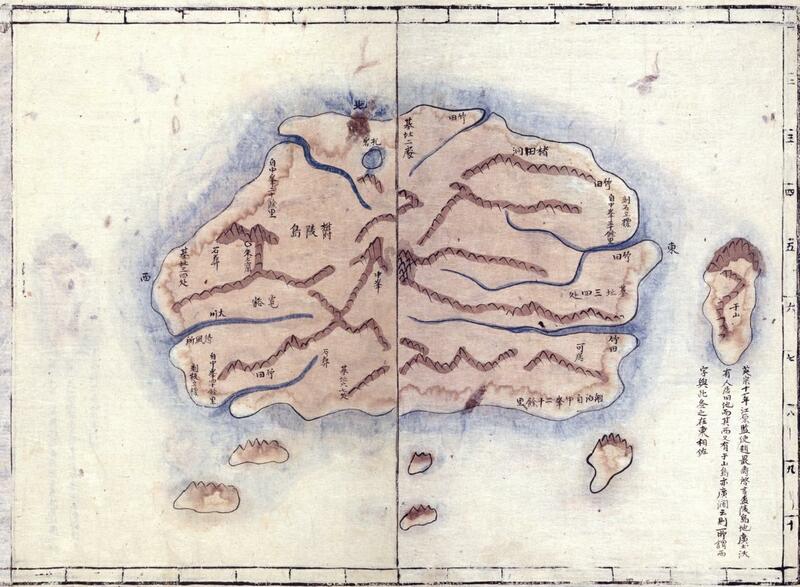 Even though he seemed unsure of their names, King Kojong seemed sure that three islands made up Ulleungdo. When Lee Gyu-won said that Songjukdo was Ulleungdo's only neighboring island and that Usando was just the old name for Ulleungdo, the king seemed to suggest that Songjukdo (松竹島) could be two separate islands, Songdo (松島) and Jukdo (竹島), and that if Usando (芋山島) were just another name for Ulleungdo, then that would still mean that Ulleungdo was made up of three islands. 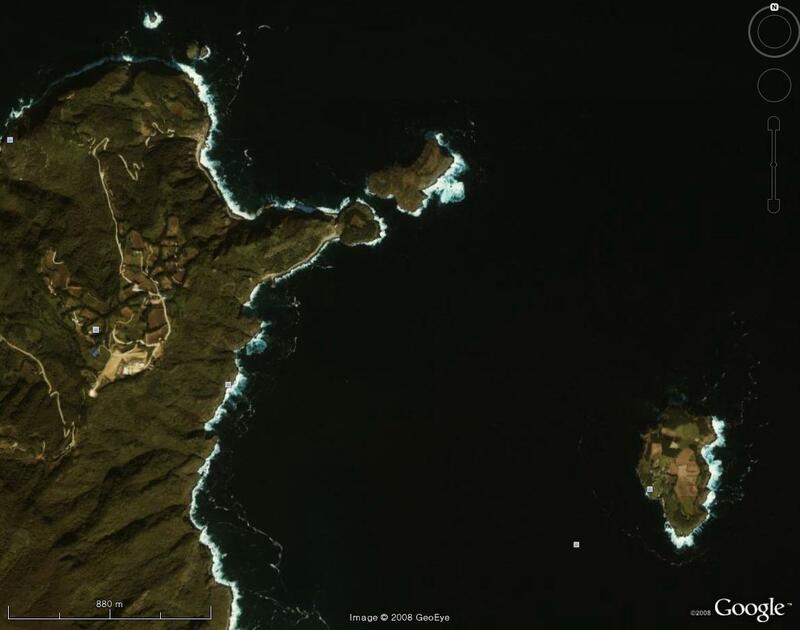 Lee Gyu-won, however, rejected that theory and said that Ulleungdo had only one neighboring island, "Songjukdo." Lee Gyu-won said that Songjukdo was "three to ten ri" (三數十里) offshore of Ulleungdo, which is 1.2 to 4 kilometers (1 Korean ri = 0.4 km). Ulleungdo's neighboring island of Jukdo (竹島) is approximately 2 kilometers off Ulleungdo's northeast shore and 4 kilomethers off its southeast shore. That means that in 1882 Ulleungdo's neighboring island of Jukdo was being referred to as "Songjukdo" (松竹島), "Songdo" (松島), and "Jukdo" (竹島). Some "Dokdo" advocates have suggested that Songjukdo was "Dokdo" (Liancourt Rocks), but ; Liancourt Rocks is approximately ninety kilometers southeast of Ulleungdo, not 1.2 to 4 kilometers. Also, Lee said Songjukdo had juniper and pipestem bamboo on it, which would eliminate any possibility that Songjukdo was Liancourt Rocks since Liancourt Rocks were just barren rocks with no soil to grow juniper or bamboo. The conversation between King Kojong and Inspector Lee Gyu-won shows quite clearly that, in 1882, even Korea's king and his advisors were unsure of the geography of Ulleungdo. 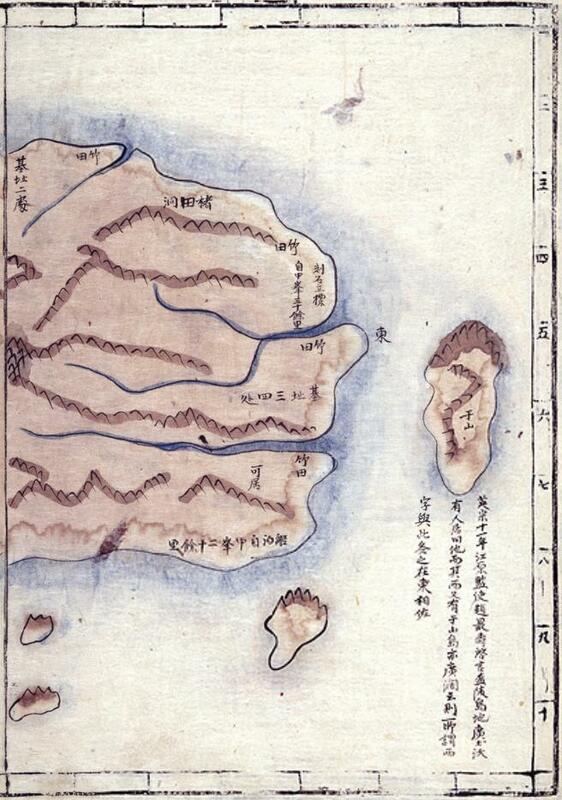 Korea's maps showed Usando to be Ulleungdo's neighboring island of Jukdo, but Korean documents, including the Yeojiseungram (輿地勝覽) mentioned above, apparently also showed Songjukdo (松竹島) as a neighboring island. 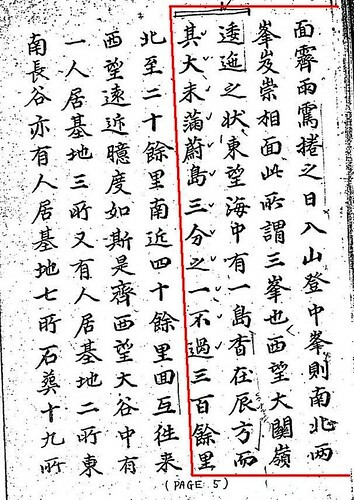 Also, a secret Japanese mission to Korean in 1869 reported in an 1870 document HERE that Ulleungdo had a neighboring island called "Matsushima" (松島 = Songdo), which was an island the Japanese had no record of. Before that, in 1794, Ulleungdo Inspector Sim Jin-hyeon (沈晉賢) reported that Ulleungdo had a neighboring island called Jukdo (竹島), but did not mention either Usando or Songdo in his report. 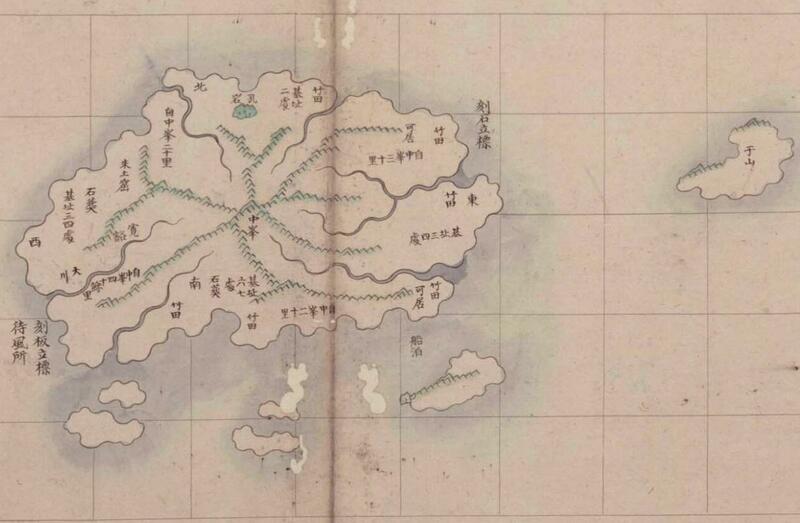 When Lee Gyu-won conducted his inspection of Ulleungdo in 1882, he found two islands: Jukdo (竹島) and Dohang (島項). 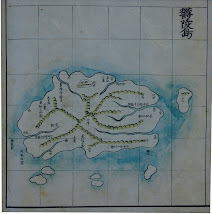 His map of Ulleungdo showed that Jukdo was almost certainly Ulleungdo's present-day neighboring island of Jukdo (竹島), and Dohang was Ulleungdo's Gwaneumdo (觀音島). He reported that he could find no islands named "Songjukdo" or "Usando" and concluded that Usando was just another name from Ulleungdo. Neither King Kojong nor Lee Gyu-won showed any clue that they knew Liancourt Rocks even existed. Why aren't there any Korean maps that show either Usando, Songjukdo, Songdo, or Jukdo together? The most logical explanation is that they were four different names for the same island. 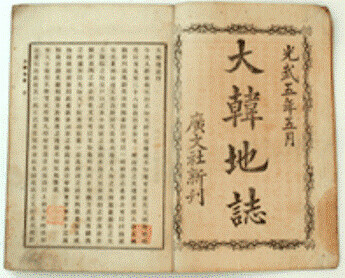 "Songjukdo" (松竹島) was obviously a combination of two names--"Songdo" (松島) and "Jukdo" (竹島)--both of which were names that were mentioned during the territorial dispute between Korea and Japan in the 1690s. Then, Korea claimed that Jukdo (竹島) was an alternate name for Ulleungdo that Korean fishermen used, and An Yong-bok had claimed that the Japanese name for Usando was "Matsushima" (松島 = Songdo). Since Korean maps showed Usando to be Ulleungdo's neighboring island of Jukdo, it was almost inevitable that some would start using Songdo (松島) to refer to Ulleungdo's neighboring island of Jukdo. 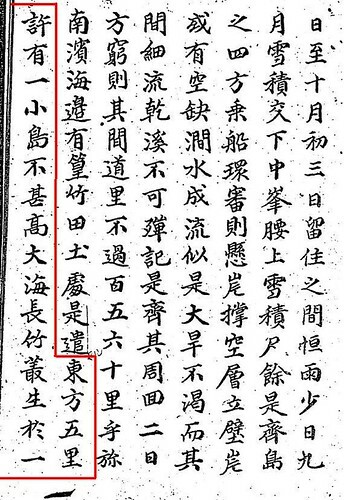 Even in 1899, the Korean newspaper Hwangseong Sinmun (皇城新聞) reported that Ulleungdo's most prominent neighboring island was "Usando/Jukdo" (于山島竹島), which was most likely written to show that there were two names for the same island. If the "Usando/Jukdo" in the 1899 article meant two separate islands, as some claim, then why was only Jukdo, not Usando, mentioned one year later in Korea's Imperial Edict 41, which upgraded Ulleungdo's status to a county? In September 1904, the Japanese naval vessel Niitaka (新高丸) was visiting Ulleungdo as part of its mission to lay telegraph cable between Ulleungdo and the Korean port of Jukpyeon (竹邊), which was near Uljin on the Korean peninsula. In the September 25 entry in the ship's log, it was recorded that a Japanese civilian staying on Ulleungdo had personally visited Liancourt Rocks, which he said was written as "Dokdo" (獨島) by Koreans and was called "Riangko-shima" by Japanese fishermen. He said that there was a certain amount of fresh water on Ulleungdo. He also said that the people from Ulleungdo who hunted sea lions on Liancourt Rocks used Japanese ships, which means that if any Koreans were among those doing the hunting, they would have been working for the Japanese. Regardless of what Korean Web sites may say or imply, this was the first time that the name "Dokdo" (獨島) had ever been used to refer to Liancourt Rocks. The year before, in 1903, it was recorded that Korean fishermen were using the Japanese name to refer to Liancourt Rocks, which suggests that Koreans had just recently learned of the rocks. There are no maps or reliable records to suggest that Koreans ever traveled to Liancourt Rocks before 1903. Liancourt Rocks is written as "Dokdo" (獨島) by Koreans and is called "Riangko-shima" by the fishermen of our country. As can be seen on the attached map, it is made up of two rock islets. The west islet is about 400 feet high and has a slope so steep that it would be difficult to climb; however, the east island is relatively low and has weeds growing on it. He said that the land on top is a little flat, so it would be suitable for buidling two or three small huts. A small amount of fresh water can be gotten from a hollow on the east shore of the east island. On the south side of this island, at point "B," there is a spring about three ken (5.5 meters) above sea level where water flows down toward the west. There is so much of it that it flows throughout the year. On the west side of the west island, at point "C," there is also clear water. The scattered rocks around the islets are generally flat, and the larger ones are big enough to spread out dozens of tattami. They are always above the surface of the water, and sea lions gather there. The space between the two islets is suitable for sheltering a boat, but it is common to bring small boats up onto the shore. He said that when the wind and waves get so strong that it is difficult to shelter on the island, boats generally seek shelter on Matsushima [Ulleungdo] and wait for fair winds. The people who travel from Matsushima [Ulleungdo] to hunt sea lions use Japanese boats that are sixty to seventy seok in size. They build temporary shelters on the island and stay there about ten days each trip. He said he heard that they make a lot of money. Also, the number of people sometimes exceeds forty or fifty, but a shortage of water is not being reported. There have also been a number of trips this year. And he said that on June 17, he personally saw three Russian ships appear in the vicinity of the island. After drifting offshore for a while, the ships sailed off to the northwest. The following is a link to pages from the 16th issue of the 1883 edition of Japan's Seaways Magazine. The pages seem to be talking about the visit of the Japanese naval vessel, Amagi, to Ulleungdo in 1880. Can someone confirm that and give me, at least, a summary of what it is saying? There seem to be pages from a couple of different issues on that linked page, but the first three pages of the open book are from the 16th issue. The following are translations of the "Takeshima (Liancourt Rocks)" section from the 1907 edition of Japan's Joseon Seaways Directory. One item of interest from the directory is that it says that Japanese fishermen used the name "Yangko" to refer to Liancourt Rocks, and Koreans wrote the name of the island as "Dokdo" (獨島), which was first reported by the Japanese naval vessel Niitaka in 1904. In a 1903 document, however, it was written that Korean fisherman used the Japanese name for Liancourt Rocks, which suggests that Koreans had recently just learned of the rocks from the Japanese. Before 1903, there are no records or maps to suggest that Koreans ever visited Liancourt Rocks. By the way, the name "Dokdo" (獨島) literally means "Solitary Island," and was a name regularly used to describe such islands in old Korean documents. In fact, Ulleungdo had also been described as a "Dokdo." Therefore, it is quite possible that "Dokdo" was first used as a descriptive term by Korean fishermen, who later adopted it as their name for Liancourt Rocks. The fact that Korean fishermen never used "Usando" to refer to Liancourt Rocks is more evidence against Korea's claim that Usando was the old name for the rocks. The Sea is bounded on the east and south by the Japan islands, and on the west and north-west by the coasts of Korea and Russian Tartary is about 900 miles long, NNE and SSW, and 600 miles East and West, at its broadest part. Surrounded by land on all sides, this sea is only accessible by the following narrow passages:- To the south by the Korea strait, which connects it with the China sea; to the east by La Perouse and Tsugar straits, by which it communicates with the Pacific; and to the north by the gulf of Tartary, through which it communicates with the sea of Okhotsk by the gulf of Amur; this sea is, as far as is known, clear of rocks or dangers with the following exceptions: Liancourt Rocks, Matsu Sima (Dagelet island) and Waywoda Rock. The island was named after the French ship Liancourt, which discovered them in 1849; they were also called "Menalai and Olivutsa rocks" by the Russian frigate Pallas in 1854, and Hornet islands by H.M.S. Hornet in 1855. Koreans write them as "獨島," and Japanese fishermen call them "Yangko." They are a small group of islets located about eighty nautical ri from Oki Island and fifty nautical ri from Ulleungdo. They are made up of two islands and several small islets. The two islands are separated by a narrow waterway that is about a quarter ri wide and face each other from east and west. The west island, elevated about 410 feet above the sea, has a sugar-loaf form. The east island is relatively low and flat-topped. Most of the many small islets that surround them are flat rocks that bearly break the surface of the water. Most are big enough that a tatami of tens of jang could be laid out on them. Both islands are desolate and bare and are completely exposed to the wind and sea. There is not even one tree, only a little grass growing on the east island. The slopes of the islands are sheer precipices with some layering of rocks. There are many strange-looking caves, but they cannot be reached. These caves and the small islets are the breeding grounds for sea lions. 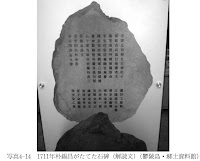 The naval vessel Tsushima measured the depth of the waters around this island and said that it measured the depth at about fifty-eight fathoms at a spot about nine ryeon (0.9 nautical ri) from the southern tip of the east island. The island is a little dangerous because it is near navigation routes in the Sea of Japan. There is no level ground on the island. Even though the waterway between the two islands is narrow, there are two or three flat, gravel patches there, but it would be difficult to avoid the assault of the waves. There is some flat land at the summit of the East Island, but there is no path leading up there. There is only a small patch of about three or four pyeong on the southern tip that blocks the northwesterly wind. The ridge spine of the West Island runs east to west. The slope of the upper half of the ridge is almost vertical, but the slope of the lower half is fairly gentle, so the cliffs can be reached. Therefore, if the hard rocks of this section can be excavated, then there would seem to be access to flat land sheltered from all wind except that from the east. As per above, there is absolutely no land on this island suitable for building a house. In November of the 37th year of Meiji (1904), it was said that the naval ship Tsushima found a small thatched hut for fishermen on the east island, but it was badly damaged by the wind and waves. It is said that each summer dozens of people come from Ulleungdo to this island to catch sea lions, and that they build a shelter and stay for about ten days each trip. There is a cave on the southwest corner of the west island where a fair amount of water falls from the ceiling rocks, but it falls like rain, so it would be difficult to gather. There are a few springs along the midway section from the summit where water comes out, but they are so polluted by the excrement of the sea lions that they give off an odor, so they are absolutely not suitable for drinking. It is said that the fisherman who come here to catch sea lions use the water on this island for cooking, but the water they use for their tea is brought from somewhere else. Location: According to the results of a survey by the American naval vessel New York in 1902, Takeshima is at a northern latitude of 37 degrees 9 minutes 30 seconds and an eastern longitude of 131 degrees 55 minutes. It is semicircular island with a circumfererence of 18 nautical ri (浬 = nautical miles). The whole island is a collection of sharp conical hills, densely covered with trees, and supports an imposing peak in the center, at latitude 37° 30′ N. and longitude 130° 53′ E, that rises 3,208 shaku [feet]. Jukdo (Boussole Rock) is off the northeast shore, and about two and three-quarter nautical ri (浬) west-southwest of there is a rock where the water is two to three shaku (feet) deep. There are several rock islets offshore, especially, on the north and east sides. Some reach a height of 400 to 500 shaku (feet). They are all, like the island, steep, and the lead affords no warning, but none of them are more than a quarter of a mile from the cliffs, except for Boussole Rock, the largest, which is seven ren (cables) off the northeast shore. Hole Rock, off the north shore, is remarkable in that it has a large hole, or rather a natural archway, through it. On shore almost facing the rock is a smooth but very steep, sugar-loaf-shaped, bare granite rock that is about 800 shaku [feet] high. There is also a rock off Seal Point, at the southern tip. The sides of the island are so steep that soundings could only be obtained by going up almost to the base of the cliffs. Landing may be effected in fine weather, with difficulty, on some small gravel beaches, which occur at intervals, but the greater part of the island is quite inaccessible. Korean residents were eight-five families with 260 people (175 men and 85 women), according to a survey at the end of December 1904. However, they increased to 110 families with 366 people (219 men and 147 women) by the end of June 1905. However, because these residents live next to the land they cultivate, their houses lie scattered, and there are only eight villages. The island has an island chief living there. The Japanese on the island are mainly woodcutters, carpenters, fishermen, sailors, and brokers. There are few other professionals. The Japanese population was 230 at the end of June 1905. The hot and cold temperature differences on the island are not extreme. Southerly winds prevail from April to September while northerly winds prevail from October to March, with an especially strong northwest wind in November. They have snow from the end of October to the end of March. Sometimes there is still snow on the top of the mountain in May. The place is very healthy. There have been no epidemics, such as smallpox. The islanders attribute it to the good quality of the water. The island's main product is soybeans. Others include barley, millet, barnyard grass, and potatoes. The average soybean yield is 3,000 to 4,000 koku annually, while the other grains are raised for the consumption of the residents. There is usually no shortage of food. The fishing on the island is mainly for abalone. Each year a great deal of dried abalone is exported. A sea animal called a sea lion lives on an island called Takeshima (Liancourt rocks), which is located southeast of the island. The people on this island (Ulleungdo) began to catch them sometime about 1904. The hunting season is six months, from April to September. There are three boats that hunt for sea lions, and each boat catches an average of five. The abalone which the Japanese catch are caught by using two diving apparatuses and two steamships, and they say that the average catch per day is 1,130 kin. There are no wild animals on the island, but wildcats and pigeons are sometimes visible. As to the wood available, there are lots of zelkova and pine. The island's exports include soybean, zelkova wood, dried abalone, sea lion skins, sea lion oil, and the squeezed dregs of sea lions. Its imports include polished rice, rice, sake (rice wine), shochu (clear distilled liquor), petroleum, sugar, cotton, cotton yarn, cotton fabrics, iron, straw bags, matches, ceramic ware, tableware, soy sauce, and somen (thin wheat noodles). The total export revenue from April to June in 1905 was 12,075 yen, and the total imports was 3,116 yen. In each village, a few chickens and eggs are available at cheap prices. Clear water is available at various places and and is said to be of good quality. 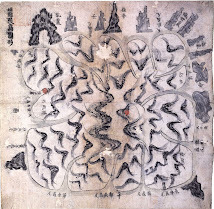 竹島(다께시마)(Liancourt rocks): 1849년 프랑스 선박 가 이를 발견하여 라 칭하고 있으며, 1854년 러시아 함대 [팔라스]는 라고 하였다. 1855년 영국 함정 는 이를 라고 부른다. 한인(韓人)들은 [獨島]라 쓰고, 일본어부들은 [リアンコ(리앙꼬)]島라고 한다. 이 섬은 일본해에 있는 하나의 작은 군도로 오끼국 섬에서 약 80해리, 울릉도에서 약 50해리 떨어진 곳에 위치하며 폭 4분지 1해리의 좁은 수도를 사이에 두고 동서로 대응하는 두 개의 섬과 그 주위에 있는 여러 작은 섬들로 구성된다. 서도(西島)는 해면상 높이가 약 410척이고 봉당(棒糖) 모양을 이루고 있고, 동도(東島)는 비교적 낮고 정상에 평탄한 땅이 있으며, 주위의 여러 조그만 섬들은 대개 편편한 암석으로 약간 수면에 노출되어 있고 그 크기는 대부분 수십 장의 다다미를 깔기에 충분하다. 두 섬 모두 황폐한 민둥산으로 해풍에 완전히 노출되어 있어서 한 그루의 수목도 없으며, 동도에 약간의 풀이 자랄 뿐이다. 섬 기슭은 단애절벽이고 약한 석층을 이루어 기이한 모양의 동굴이 많지만 오를 수가 없다. 이러한 동굴이나 조그만 섬들은 바다사자들의 서식지가 된다. 이 섬 부근 수심은 군함 對馬호가 동도 남단으로부터 북서방 약 9련(0.9해리) 떨어진 곳에서 58패텀의 수심을 얻었다고 한다. 이 섬은 그 위치상 일본해를 항해하는 선박의 항로에 가까워서 야간에 위험하다. 島上의 平地: 섬의 평지는 없고, 수도의 양측에 협소하지만 평탄한 자갈밭이 두 세 군데 있지만 모두 파도의 침습을 면하기 어렵다. 동도(東島)는 그 정상에 평탄한 땅이 있긴 하지만 이곳에 오르는 길이 없고, 오직 섬의 남단에 북서풍을 막아주는 3-4평의 작은 평지가 있을 뿐이다. 서도(西島)는 그 동서에 산등성이가 있는데, 그 상반부는 거의 직립해 있으나, 하반부는 경사가 꽤 완만해서 그 절반 부분까지 도달할 수 있고, 이 부근의 견암을 개착하면 동풍을 제외한 외풍을 막을만한 평지를 얻을 수 있을 것으로 보였다. 섬에는 위와 같이 가옥을 지을만한 땅이 전혀 없었고, 明治 37년(1904) 11월 군함 對馬호가 이 섬을 실사했을 때 동도에 어부용 작은 초가집이 있었으나 풍랑으로 심히 파괴되어 있었다고 한다. 매년 여름철이 되면 바다사자를 잡기 위해서 울릉도에서 넘어오는 사람이 수 십 명에 이르며, 그들은 섬에 조그만 거처를 만들어 매회 약 10일간 임시로 거주한다고 한다. 담수(淡水): 서도(西島)의 남서쪽 구석에 하나의 동굴이 있고, 그 천정 부분 암석에서 떨어지는 물의 양이 상당히 많지만, 빗물이 떨어지는 것 같아서 이를 받는데 어려움이 있다. 산 정상에서 중턱을 따라 몇 군데 물이 나오는 샘이 있으나 바다사자들의 분뇨로 오염되어 악취를 풍겨서 도저히 음료용으로는 적합하지 않다. 바다사자를 잡기 위해 오는 어부들은 이 섬에서 나는 물을 받아서 취사용으로는 쓰지만, 차로 마시는 물은 다른 곳에서 가지고 온 물을 사용한다고 한다. 위치(位置): 竹島(다께시마)는 1902년 실시한 미국 함정 호의 검측에 의하면 북위 37도 9분 30초, 동경 131도 55분에 있다.